Thuso Mbedu makes history with leading role in Hollywood series. Many know her as Winnie in the Mzansi Magic teen drama series Is'thunzi, a role that got her nominated for an Emmy Awards in both 2018 and 2019. Now, she is surely showing that she is a game changer and hard work pays off, as the Emmy-nominated and Safta-winning actress is set to play Cora, the lead role in Barry Jenkins's adaptation of The Underground Railroad. Mbedu has made history as she becomes the first South African actress to lead a Hollywood TV series. You go, girl! According to Variety, "The Underground Railroad chronicles young Cora's journey as she makes a desperate bid for freedom in the antebellum South. After escaping her Georgia plantation for the rumored Underground Railroad, Cora discovers no mere metaphor, but an actual railroad full of engineers and conductors, and a secret network of tracks and tunnels beneath the Southern soil". The series will be directed by Barry Jenkins. Minister of Arts and Culture Nathi Mthethwa has shared some congratulatory words on social media, thanking Mbedu for elevating the art industry to great heights." He wrote, "Award-winning South African artist & two-time Emmy Nominee #thusombedu has once again astonished us all by becoming the 1st South African actress to lead an American series. Not only has she elevated our art, she is an inspiration for young & old to never stop pursuing greatness." Pearl Shongwe - God bless Thuso Mbedu ♥️🙏🏽 eternally inspired by this young woman. Peniel M - Silent killer !!!! 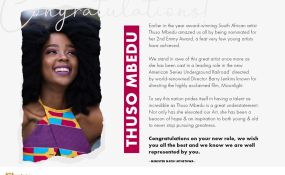 !congratulations to thuso mbedu !!!! !we so proud !!!!!!! Banyese !!!!!! Thembisa Mdoda - Thuso Mbedu 😍🙌🏾😭...what an amazing achievement. She's gonna knock it, the heck, out the park 🎭 !!! Minnie Dlamini Jones - @ThusoMbedu you continue to make us proud 🇿🇦 Congratulations my girl and keep reaching for the stars!!! South Africa and the continent is incredibly proud of Thuso and her accomplishments. Congratulations!